While the mesh look generally doesn't look good on dudes (especially hairy ones), it certainly looks good on a professionally built gaming case. Thanks to it's intricate mesh design, the Cooler Master Centurion 534+PLUS Case is built to deliver a superior amount of airflow directly to your system. Another incredible feature of the Centurion is it's incredibly ease-of-use, provided by it's tool-free design for quick assembly and screwless HDD for quick access to your interior components. The Cooler Master Centurion 534+PLUS Case is further enhanced by a cool blue LED on the mesh trim of it's front panel. In addition, the case also includes a front I/O panel for instant access to your external inputs, a 120mm rear exhaust fan, as well as a temperature-reducing air guide v1.1 on the side panel chassis. 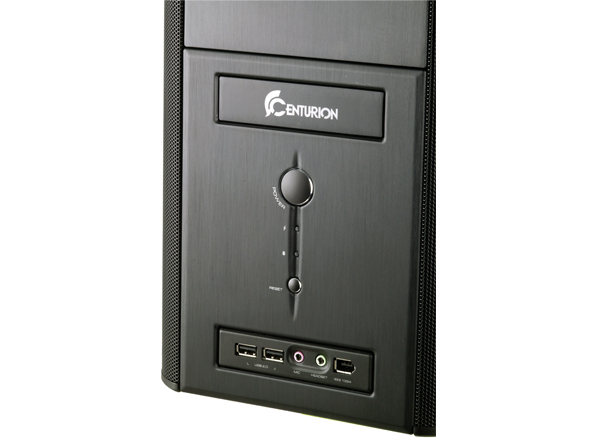 Material: Aluminum, SECC Dimensions: 18.90" x 7.95" x 17.13"
Side Panel: Solid Drive Bays: 5 x Ext. 5.25" / 4 x Int. 3.5" / 1 x Ext. 3.5"
Dimensions: 18.90" x 7.95" x 17.13"